Clelia (Eleonora Rossi-Drago) embarks from Rome to set up a fashion-salon in Torino. Shortly after arrival, she finds herself caught up in the (melo)dramas of a bourgeoise circle of acquaintances (including the iconic Valentina Cortese), and their attendant attempts at suicide, their class prejudices, and the romantic alliances that threaten to transform the social clique into an emotional tar-pit. 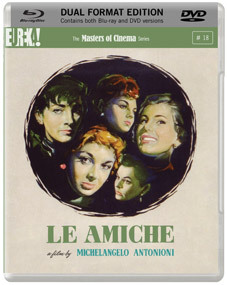 A key film of Michelangelo Antonioni's middle-period, Le amiche (The Girlfriends) finds the Italian master expanding his palette in the realm of traditional narrative cinema by way of his powerhouse direction of an ensemble cast, while entrenching his devotion to expressing the emotional makeup of the modern woman. In the process it lays the groundwork for such '60s breakthroughs as L'avventura and La notte. A lengthy booklet containing newly translated critical pieces about the film, excerpts of interviews with Antonioni, and more!